Grapelive: You Say Rosé, I Say Rosato! 2017 Martha Stoumen, Nero d’Avola Rosato, Benson Ranch, Mendocino County. Martha Stoumen, a new talent, is crafting some delightfully soulful wines that are inspired by some of the world’s greats, after getting her masters at UC Davis she searched out influential producers that had a commitment to tradition and their land, her travels led her to an amazing series of apprenticeships including Reinhard Löwenstein (Heymann-Löwenstein, Mosel), Jordan Fiorentini, who makes Epoch (formerly of Chalk Hill, California), Chris Brockway (Broc Cellars, California), Clive Dougall (Seresin, Marlborough), Didier Barral (Léon Barral, Faugères, France), and Giusto Occhipinti (COS, Sicily)! Stoumen’s dark colored Rosé of Nero d’Avola is a medium/full style dry version with a boat load of flavor, true to Italian Rosato(s) and with lots of energy and it’s pure excitement in the glass, great with food especially. The palate jumps with jolly rancher watermelon, sour cherry, a pink grapefruit tang and wild strawberry, along with a cider note and star anise, it’s a racy pink wine that shines with well judged balance and life. This is more robust and with serious dimension than you’d imagine, adding a striking mineral and wet rock elements to the mix along with a light rosewater and nectarine note. 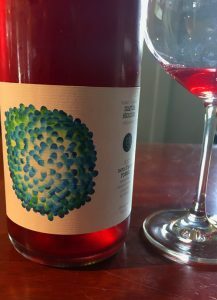 Wow, I gotta say this intriguing Rosé, and while not a delicate wine, it has a sense of purpose and class all it’s own, no doubt Stoumen is a rising star and this is a great gateway into her wines, I can’t wait to get this thrilling Nero d’Avola Rosato to the beach!